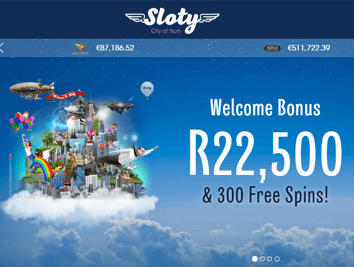 Despite its recent launch in 2017, Sloty Casino is making a name for itself as a great online casino option for players from South Africa who can cash in and withdraw winnings in South African Randswithout the worry of losing out on currency conversions. The casino is backed by a professional customer support team that is easily reachable at all times. When it comes to their promotions their welcome bonus is second to none! The casino features an array of high quality games which include video slots, jackpot games, roulette games, poker games, blackjack games, live casino games, scratch cards and several others. At the time of writing, there are over 390 games when it comes to the desktop version of the Sloty casino and even the mobile version of the casino is filled with over 230 games so you never get bored or feel the monotony. The welcome bonus at Sloty casino is one of the best we’ve come across. It is highly rewarding and if you make the right deposits on your first four deposits, you stand to make as much as R22,500 just as welcome bonuses. Furthermore, the welcome bonus also includes an amazing 300 free spins. When it comes to the free spins, you need to note that the 300 free spins are issued at a rate of 30 free spins per day for ten consecutive days. This starts on the day you make your first deposit. Also every set of 30 free spins are valid for 24 hours and issued at 12:00 GMT every day. The free spins are applicable on the following games – Starburst, Gonzo’s Quest, Red Riding Hood and Aloha! Going back to the welcome bonus which can be as much as R22,500! There are a few terms to qualify for the welcome bonus. To begin with, the minimum qualifying bonus is at least R300, so any deposit below that amount will not attract any welcome bonus. Secondly, in order to withdraw your welcome bonus, you will have to meet a wagering requirement of 40X. Welcome bonuses are pretty common place amongst online casinos. Welcome bonuses are offered by nearly every online casino there is, however, Sloty casino goes the extra mile with their bonuses. Not just with respect to their welcome bonus, but also other regular bonuses for existing players as well. This includes free spins and reload bonuses as well. The only thing lacking at Sloty Casino at this time is a no deposit bonus. The welcome bonus is easily one of the most lucrative in the industry available for South African players. What more? Even if you are no longer a new player, there are plenty of weekly promotionsand even a highly rewarding VIP club to keep you happy, satisfied and smiling from ear to ear. If you don’t want to miss out on any of the bonuses, you can subscribe to email list and you will get notified about every single promotion, bonus, tournament and everything else in between. Happy Hour – This promotion runs every Tuesday from 16:00 – 18:00 hours and all depositors can qualify for it. To be eligible you must make a deposit and then play through at least $20. When you make a deposit during this time window, you will automatically receive 10 free spins the very next day. The free spins can be used on three amazing games, namely, Fairytale Legends: Red Riding Hood, Aloha! Cluster Pays and Dazzle Me. Game of the Week – This promotion runs every Monday! The eligibility criteria is a minimum of 2 deposits since the time you have registered and you must have wagered a minimum of $10 during the prior week. The game of the week changes every week, and the game for that particular week will be shown to you on a cloud and the cloud will be loaded with a 25% up to $100 bonus and also include ten free spins so you can put those reels on fire. When it comes to Sloty Casino, what is really outstanding is how the casino website is simplistic yet highly effective. There is a lot of affordance for all the elements, it is very user friendly and even players that are not technically savvy will be able to use and navigate through the website like a cake walk. There seems to have been some extensive usability testing done prior to the launch of this amazing online casino. Furthermore, unlike a lot many online casinos which only have games from one supplier and most of the games have the same feel to it, Sloty casino features games from multiple software providers so it is not only a great number of games, but there is also good variance amongst the games on offer. The software providers include big brand names in the online casino industry such as NetEnt, Evolution Gaming, Play N’ Go, Microgaming, NYX Interactive and Quickspin. There are both instant play games and download and play games, so if you are not a fan of downloading content onto your native device or desktop, then you can simply play within the browser itself thanks to games built on technologies such as Flash and HTML5. Sloty Casino is especially popular amongst South African players because of its superb game collection. With over 390 games featured on the desktop version and over 230 games on the mobile version. You will always find edge of the seat action at Sloty Casino. As mentioned, the games are all unique and differ from each other quite a bit considering that there are multiple software providers in the mix. Therefore, you are never going to be bored especially when you will find top quality games from NetEnt, Evolution Gaming, Play N’ Go, Quickspin, NYX Interactive and Microgaming. Sloty Casino checks all the boxes and exceeds expectations in many departments. Their game collection is extensive and filled with high quality games. Their support is easy to reach and helpful while the promotions are simply some of the best available to South African players. The casino acceptsan array of deposit and withdrawal (banking methods). For players who love to gamble on the move there, the casino features a robust mobile platform. Wrapping up the casino’s brownie points are the website layout and user interface, which is simplistic and seamless. You cannot go wrong with Sloty casino.